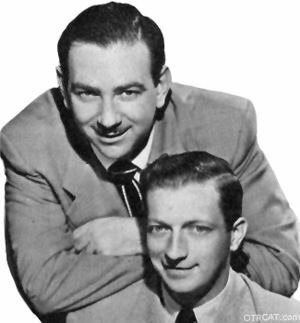 "Bob and Ray Sept 13, 1948 Broadcast"
The duo Bob Elliott and Ray Goulding were the quiet comedy team. 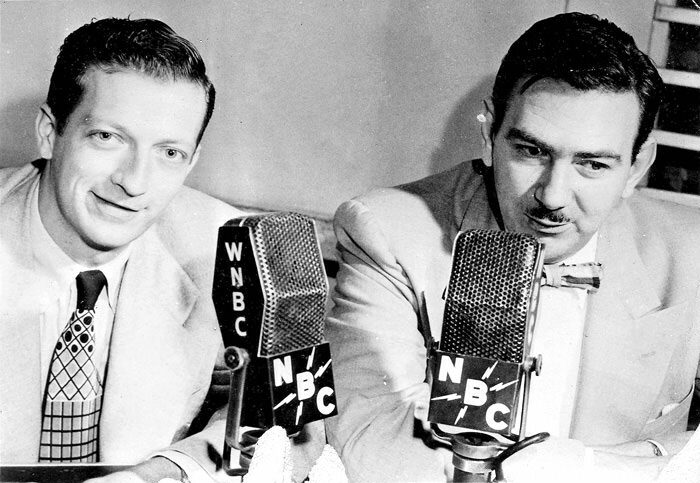 They were never headliners, and spent most of their career carrying on the tradition of old time radio with a series of characters that are classics. Wally Ballou, Roving Reporter is always among the favorites of every Bob and Ray fan, for he was the"on-the-scene" reporter of all the Bob and Ray radio productions. Many of Bob and Ray's sketches are famous, such as their lampoon of Mr. Keen, Tracer of Lost Persons, called Mr. Trace, Keener than Most Persons. They did "One Feller's Family, a takeoff on One Man's Family. Bob and Ray loved to skewer radio soap operas with The Gathering Dusk, and Mary Backstage, Noble Wife (based off Mary Noble, Backstage Wife of course!). Biff Burns handled sports in the Sports Room, and Steve Boscoattempted sport reporting as well as pleas for money.They had shows on local Boston and New York stations.Some of the material presented here is from their wonderful Boston live old time radio show in the afternoon, when they would run through routines and ad-lib with musical accompaniment to pass the time. So much of the fun of these live shows is how effortlessly the patter is ad-libbed, and the near-mental telepathy that the two have created in their comedy, regardless of the topic.Also included in this collection are some of their spoof shows, such as Mary Backstage. 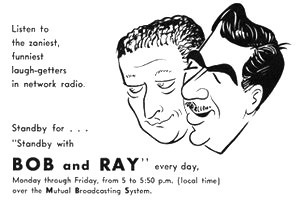 The rest is from perhaps the most polished period of Bob and Ray, the Radio series of the mid 1950s. Here we have the great characters and routines, great sound and production. What a wonderful collection for the true fan of Bob and Ray! John Dunning in "On the Air, The Encyclopedia of Old Time Radio,"says of the 1959-60 show, "But at their best, in their 1959-60 daily 15 minute series .. they were as funny and fresh, as clever and witty, as anyone who ever used the medium." Bob and Ray are really singular talents, but if you like them, you might enjoy the Americana odd-personality serial humor of Vic and Sade, the verbal fireworks of the Marx Brothers. Be the first to comment on "Bob and Ray"